Bida Nai is the inner of the two islets at the southern tip of the Phi Phi Islands. Koh Phi Phi Don is the largest of the islands and where the ferries dock. Tourists can find hotels, resorts, nightlife and restaurants here. The main island (Koh Phi Phi Don) is the shape of a capital H. 3km. south is Koh Phi Phi Lei (pronounced ‘Ko pee pee lay’), where Leonardo Di Caprio’s The Beach was filmed. On Phi Phi Lei’s southern tip are two limestone rocks, jutting vertically out of the sea. These are Koh Bida Nok and Koh Bida Nai. Diver at Bida Nai Photo by Ilse Reijs & Jan Noud HuttenBida Nai means ‘inner Bida’ and is therefore the limestone islet nearer of the two to Koh Phi Phi Don and Lei. It is more protected from the open sea and weather than Bida Nok is, but this doesn’t make a great deal of difference to the diving experiences to be had at these two great diving sites. Pretty much all year round the Koh Lanta diving boats are able to visit Bida Nai. 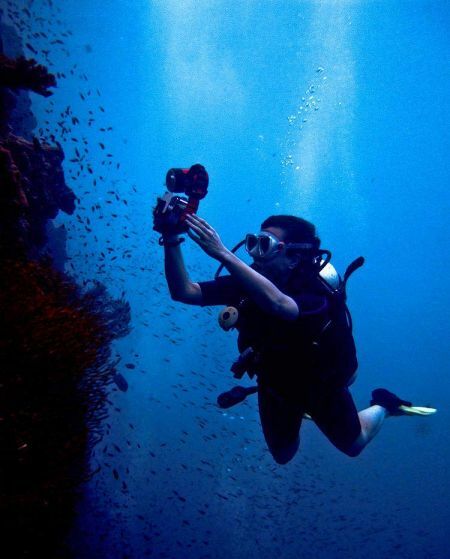 There are days when waves and underwater visibility are more suitable for scuba diving, but generally, it is a consistently good diving site, and one that every level of diver can enjoy. The seabed between Bida Nok and Bida Nai is a large flat area of staghorn coral, known locally as Fantasy Reef. Some divers make the journey across, but more often than not it is a waste of time and can confuse the boat captain for pick ups. However, from time to time something interesting or different can be spotted there. At Bida Nai, the diving is good enough to entertain experienced scuba divers, but also easy enough for anyone to dive, including those who have never tried before. Koh Lanta diving boats often use Bida Nai as the location for dives #3 or #4 of students’ Open Water courses. There are areas where skills can be safely practiced, as well as interesting marine life at all depths. Novice divers are limited to 12 metres, and Open Water divers to 18m. There’s plenty to see at Bida Nai from depths of nearly 30m right up to the surface, making sure that all levels of diver can enjoy every single minute of their scuba dive. The selection of marine life to see at Bida Nai is impressive and comes in all shapes and sizes. Starting with the big fish, divers are almost guaranteed to see a shark at Bida Nai, but don’t get worried or too excited. Leopard Sharks - whose official common name is Zebra Sharks – (Stegostoma fasciatum) are found here nearly every day. They feed on bottom-dwelling shellfish during the night, so spend much of the daytime resting on the seabed. This species are harmless to humans and while some divers become ever-so excited to get up close to a real shark in the sea, many experienced divers in Thailand are no longer excited by sightings of Leopard Sharks. Another harmless shark which is anything but dull is the world’s largest fish, the Whale Shark (Rhincodon typus). Divers at Bida Nai are highly unlikely to see such a fish but sightings do occur at certain times of year, most commonly of young specimens at lengths or 4-6m, swimming slowly near the surface. More commonly sighted sharks here are two species of reef sharks and another species which is quite docile on the sandy seabed. Blacktip Reef Sharks (Carcharhinus melanopterus) are shy sharks, growing to about 1.6m in length. 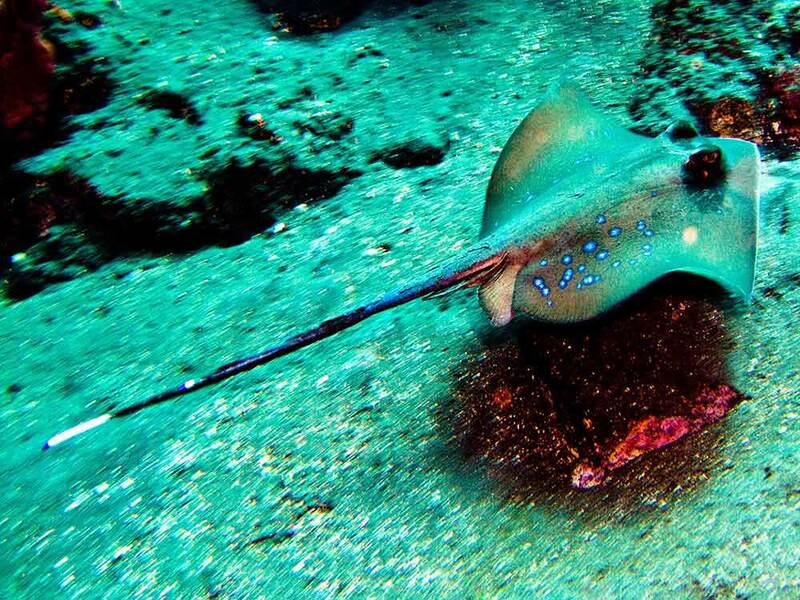 They are often seen by snorkellers at Koh Phi Phi and can sometimes be spotted by those diving at Bida Nai. Less common are Whitetip Reef Sharks (Triaenodon obesus), which are also quite shy, but single specimens can be spotted from time to time, usually in deeper water. Finally, there are sometimes Bamboo Sharks (Hemiscylliidae) hiding under rocks, but these are not really very large, exciting or active. Blue Spotted Stingray (Neotrygon Khulii) Photo by Ilse Reijs & Jan Noud HuttenStaying with larger and cartilaginous fishes, there are common sightings of stingrays, such as Blue Spotted Stingrays (Neotrygon khulii). These can sting and hurt divers with their barbs, but it is extremely unlikely. They rest on the seabed and are alert enough to dart away when approached. Their barbs are only for defence, and they are not generally found in shallow waters, so it is almost impossible for a person to step on one in Thailand. At the other end of the size scale, Bida Nai is a great place to find small creatures, such as the resident seahorse and there are even sightings of frogfish and pipefish. To see these, divers need dive slowly, keep their eyes open, and pay attention to their Divemaster guide both during the dive itself and the pre-dive briefing. In between the very large and small, there are lots of mid-size reef fish at Bida Nai. These include those in schools and those which swim alone. Many spend their whole lives here, but some are passing. In addition to fish, there are also opportunities to see invertebrates, as well as turtles and maybe even a sea snake.